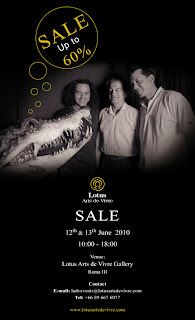 Lotus Arts de Vivre is holding a Sale of upto 60% on June 12th and 13th (10am-6pm) at the Lotus Arts de Vivre Gallery on Rama III. An alluring and exclusive upscale Thai brand of lifestyle art products, Lotus Arts de Vivre has neatly carved a niche for itself since opening its first shop in 1985 at Bangkok's Regent Hotel (Four Seasons Hotel). Over 25 years of the brand has seen it passing hands of 2 generations of the von Bueren Family, and its popularity has been ever-soaring. The brand is popular for having maintained very high standards in creating legendary and captivating pieces of designer jewelry, accessories and interior decorative arts. There just seem to be no sufficient adjectives to describe their priceless objects d'art - the very high prices speak for themselves. Four Seasons Hotel, 155 Rajdamri Road. The Oriental Hotel, 48 Soi 40 Charoenkrung Road.